And just look what a smart poster they’ve given us. The funny thing is, they’ve got a whole gang of us from East London, and are transporting us over West to read – & none of us lot have ever even been that far west before! Certainly not as a group. Quips were being made in the direction of mountaineering shops; I might take some breathing apparatus with me just in case. And also, in celebration of the fact that the proofs are in and done and the publication date is set – I’m having a new book! – I will officially start reading from Egg Printing Explained at this event. And n.b., what follows was written not by me, but by Tom Chivers who runs Penned in the Margins. 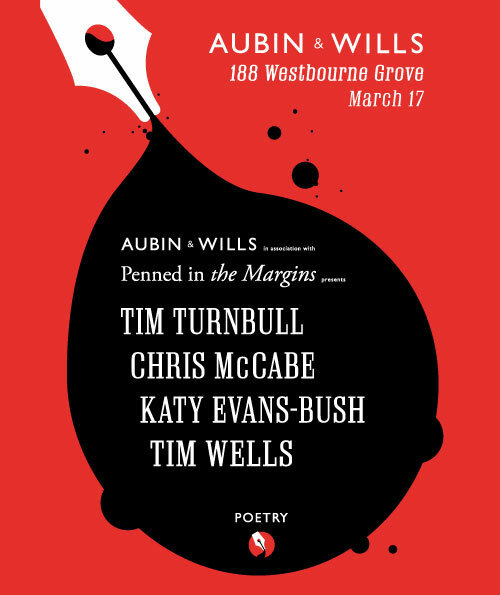 Drawing on popular entertainment such as the ballad, pulp ghost story, folk song and music hall skit, the grimly hilarious Tim Turnbull lampoons human endeavour it its many fields and forms. Tim is a hugely experienced performer and widely anthologised writer. Born and raised in North Yorkshire, he spent the 80s and early 90s honing his skills in punk, ska and industrial bands before turning to a career in poetry after a road-to-Damascus appearance at East London’s Chat’s Palace. Since then, Tim has produced four critically acclaimed collections, including Caligula on Ice and Other Poems (Donut Press, 2007/2009) and Stranded in Sub-Atomica (Donut Press, 2005), won the inaugural Edinburgh Book Festival Slam, and was the recipient of the 2006 Arts Foundation Performance Poetry Fellowship, the first award of its kind. He lives in Highland Perthshire and is married,* with a Westie. Chris McCabe was born in Liverpool in 1977. He has published two collections, The Hutton Inquiry (Salt, 2005) and Zeppelins (Salt, 2008), and a pamphlet The Borrowed Notebook (Landfill, 2009). He works as Joint Librarian of The Poetry Library and lives in London and Liverpool with his wife and son. His ‘play of voices’ Shad Thames, Broken Wharf was commissioned for London Word Festival and subsequently published as a limited edition mini-book by Penned in the Margins. It was featured as one of ‘The most beautiful books in the land’ by Time Out. Katy Evans-Bush is a poet, critic and blogger. Her first collection, Me and the Dead, was published in 2008 by Salt, followed by a pamphlet, Oscar & Henry, from Rack Press in 2010. Her second collection, Egg Printing Explained, is due out in 2011. She is a prolific and celebrated blogger under the moniker Baroque in Hackney, and has written articles for The London Magazine, The Contemporary Poetry Review, The Guardian and others. She lives in Hackney. As founding editor of the poetry magazine Rising, Tim Wells has published the work of writers such Sean O’Brien, Roddy Lumsden, August Kleinzahler, Annie Freud, John Stammers and Matthew Sweeney. His work as a poet and performer has seen him touring the U.S. (a dozen times), translated into German and Chinese, working as a guest poet on Radio London and as Writer in Residence with Tighten Up, the East London reggae sound system. His Boys’ Night Out in the Afternoon (Donut Press) was shortlisted for the Forward Prize for Best First Collection in 2006. His most recent publication is Rougher Yet (Donut Press, 2009). He lives in Stoke Newington. * As per my post recently about the perils of leaving out that all-important comma, I have added this comma in. So far as I know – and fond as he undoubtedly is of his pet – Tim T has not espoused his canine.